And so, with the handing over of the helm, members of ISLP can be assured that The Letter continues on an unchanged course.1 This is reflected in the fact that three papers from members of ISLP feature in this current issue 52, along with one further impressive and challenging chapter from Christian Fierens’ Lecture de L’Etourdit, Chapter Three of the First Turn: There is no sexual relationship. Donat Desmond, in his paper Godisnowhere: Psychoanalysis – Negative On- tology, Negative Theology introduces us to the pun God is no where/God is now here as a means of capturing two faces of Lacan’s work. Viewed as negative ontology, one face he ascribes to the influence on Lacan of Hegel’s Begi- erde (Desire) and Heidegger’s Dasein (Being there) while the other face (Janus-like?) – a negative theology – he considers to be grounded in Lacan’s later work on RSI and Joyce and the Sinthome which provides a God of the Real,‘neither of the Symbolic or the Imaginary’. Further distinctions between this negative theology of Lacan, theology and religion are equally well wrought. My own paper, The big Other, its Paradox and the Ruse of Knowledge continues my engagement with Lacan’s Seminar From an Other to the other to get to grips with the notion of inconsistency or paradox at the heart of the big Other. Paraphrasing E M Forster- ‘How do I know what I think, until I see what I write?’- the act of writing this paper has given me a certainty about the crucial logic at work for Lacan at the heart of the Real that sloppy formulations – of the Other as m(O)ther, for instance – completely evade. In The Function and Field of Speech and Language, Lacan turns to the fol- lowing few lines by Boileau when enjoining the French translators of Freud’s works to try harder to find a better translation for Durcharbeiten or ‘work through’. And sometimes add; but oft’ner take away. These same lines might well describe the craft and the effort that have gone into the fashioning of each of the contributions to this issue. They might also give us some insight into why the publishing effort of Lacan’s School was so highly prized by him – to write is surely to leave behind a trace. Can we in ISLP, through the pages of this publication, come to better own and prize our own written efforts in the name of the School? With the emergence of further contributions from our members, the answer is surely yes. 1 let us recall Freud’s use of the motto on the coat of arms of the city of Paris fluctuat nec mergitur ‘it is tossed by the waves but it does not sink’ as a metaphor for psychoanalysis and as epithet to On the History of the Psychoanalytic Movement (1914) – a ship may require a helmsman but surely he or she cannot manage without an able crew? 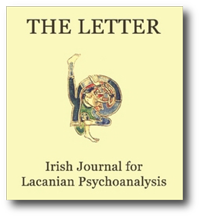 2 See editorial, Issue 51 for Cormac Gallagher’s sequencing of the printing in The Letter of the two turns of L’Etourdit and the corresponding chapters of Fierens’commentary Lecture de L’Etourdit .